With chisel and lathe, Alarka woodturner Ron Thompson transforms chunks of wood into beautiful and functional household objects — from polished bowls to platters, boxes, toys, muddlers and spurtles. So “what’s a spurtle?”, you ask. The Scots have had one in their kitchens for centuries — a decorative wooden rod used for stirring oatmeal and soups. And a “muddler” is a bartender’s tool, used like a pestle to mash — or muddle — fruits, herbs, and/or spices in the bottom of a glass to release their flavor. Well, you asked. 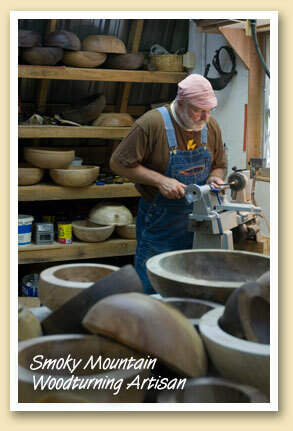 Like many area artisans, Ron sells his work primarily at craft shows and festivals, but also has items in Bryson City at The Cottage Craftsman. In May, the Marianna Black Library will showcase his work.